Founded in 1201 by the German bishop Albert, Riga is the largest of the three Baltic capitals and boasts a real kaleidoscope of architectural styles. The walking tour of the Old Town includes Riga Castle, the Dome Cathedral, St. Peter's Church, the Swedish Gate, the Three Brothers, the Large and Small Guilds and the Freedom Monument. The afternoon is reserved for an optional visit to Jurmala, the vibrant Latvian sea resort, famous for its wooden architecture and sandy beaches. In the evening enjoy an optional Latvian dinner at the stylish Restaurant Forest. Tallinn is a charming blend of medieval tranquillity and modern urban life. The medieval Old Town is a busy place in the summer with its many shops, galleries, souvenir markets, outdoor cafes and restaurants. 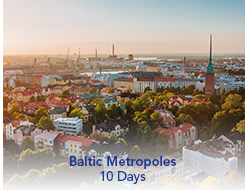 The sightseeing tour takes us around the old medieval city walls and into the Old Town where we see Toompea Castle, Dome Church, Alexander Nevsky Cathedral, medieval Old Town Hall and Great Guild Hall. In the afternoon an optional excursion is offered to Kadriorg Park and visit to KUMU, the award-winning new Estonian art museum, with its collections of classic and contemporary fine art. The evening offers an optional medieval dinner at Restaurant Maikrahv.